In order to be able to meet any business requirements – whether small, medium-sized or large – the April release invested heavily in boosting performance, reliability and scalability across the entire platform and business application. Business Central now runs much faster in typical business scenarios and usage patterns. Server resources are optimized for fast user interaction thanks to on-demand loading of page elements. An improved database also helps to process more data and load it faster. Scheduled upgrades in the cloud also prevent users from being disturbed by maintenance during work hours. Business Central always covers all important security and compliance requirements. In addition to the announced improvements and new features, the April version of Business Central will get another exciting innovation. 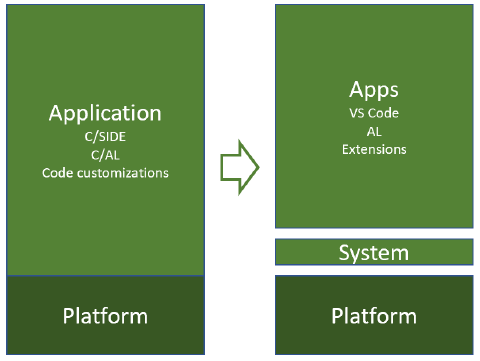 It has been announced that the existing big application will be split into a system app and an app on top as an extension, delivered in AL (instead of C/AL) with Visual Studio Code, to help partners with their industry solutions make the transition to the cloud easier. With the release of the April version, Microsoft is also strengthening the integration of “Machine Learning” into its products. The main focus here is on the integration of Dynamics 365 AI for Sales and Business Central, which allows insights to be shared between the two applications (e.g. through predictive opportunity scoring). The new Dynamics 365 Business Central Release should be officially available with these and other innovations on April 5th 2019. Detailed information can already be found in the Release Notes.